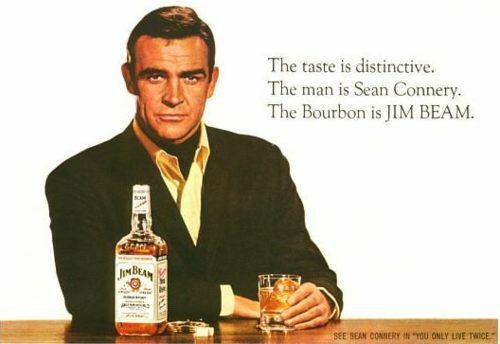 Although James Bond is most often associated with the vodka martini, the greatest Bond ever, Sean Connery, also enjoyed his bourbon – or at least acted as if he did in a series of ads for Beam, Jim Beam in the 1960s. This one, from 1967, promotes “You Only Live Twice.” Some quick internet research reveals that 007 did order an Old-Fashioned at least four times in Ian Fleming’s novels, almost always a double. Oh, James. Thanks to Westport Whiskey & Wine for calling my attention to this classic ad.